Germany has had a very controversial history of violence and racism, the most well-known arguably being the Holocaust. However, the theory of white Germans as being the “master race” existed even before the National Socialists (Nazis) came to power. 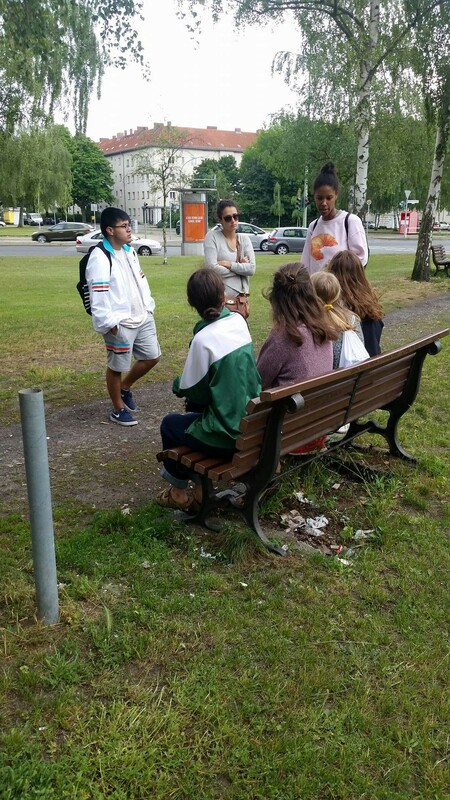 Our tour of Wedding, led by Josephine Apraku, truly shed light on the history of racism in Germany and revealed a commonly untold narrative by specifically focusing on German colonialism in Africa. 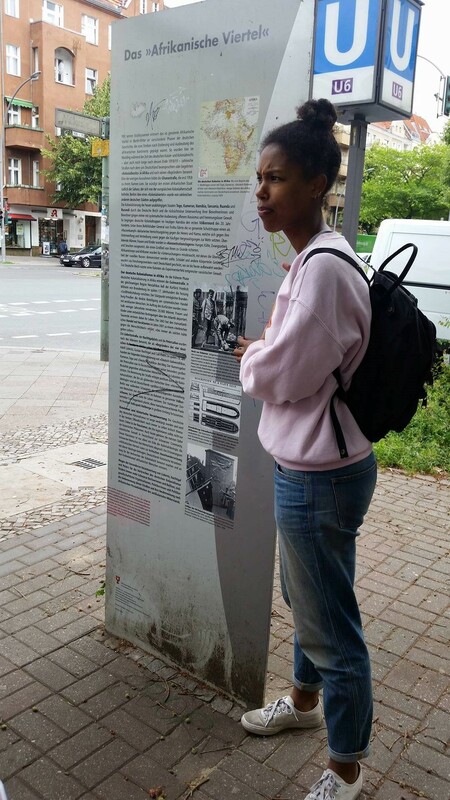 This tour, which began at the intersection of Ghanastraße and Swakopmunder Straße, examined the history of German colonialism especially in the context of the street signs located around Wedding. A quick outline of Wedding: this part of Berlin consists of twenty-two streets and one square. 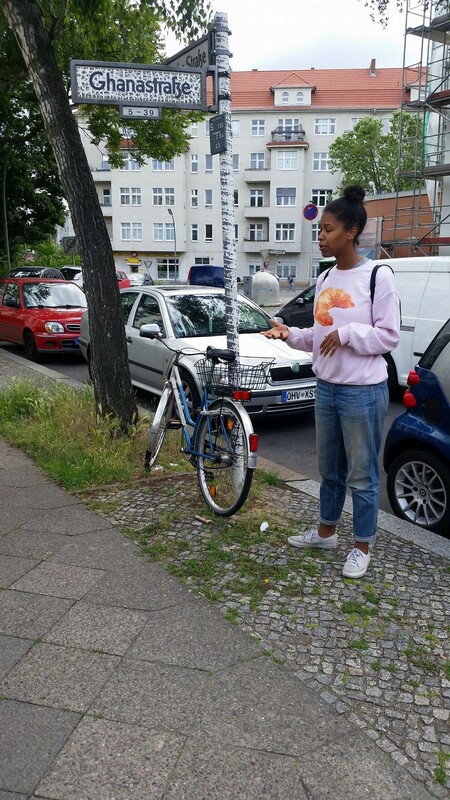 The houses around Ghanastraße were meant to be nice and affordable housing for individuals and families with low incomes, but as Josephine pointed out, many people with higher incomes now live there. The streets in Wedding, especially around Afrikanische Straße, have names that are connected to German colonialism; for example, the first and second streets named were titled after the first and second colonies that were occupied by Germany—Kameruner Straße (Cameroon) and Togostraße (Togo). Due to the lack of discussion about the colonialism period here in Germany, I was surprised to learn that Germany was the third largest colonizer in Africa. They had colonies in Africa and parts of Asia. As Josephine explained to us, one main reason for Germany to want to become a colonizing power was its increasing population. Germany felt the need to cater to their growing population and expand. This led to the colonization of places such as Namibia, of which Josephine talked about in more depth. For instance, she mentioned the influential role white German women played in the settling of Namibia. On the surface, they were sent to bring ethics and German morals (tugend) to the colony. They also had more freedom economically and politically. However, disturbingly (yet unsurprisingly), they were primarily there to ensure the birth of white babies. In other words, they were there to prevent the mixing between white Germans and Namibians and to preserve the “purity” of German whites. This feeling of competition led the German women to be hostile towards the African women, who they viewed as opponents. These white women felt and expressed no solidarity with those women in Namibia. This was very powerful for me to think about, because white women in the colony, although having more freedom than their counterparts in Germany, were still oppressed. However, instead of helping, they contributed to the oppression of African women, and by doing this, they contributed to their own oppression as well. Of course, there were still some Black babies being born. Because of this, as Josephine recounted, in 1907, the German government passed a law that refused German citizenship to anyone “with a drop of Black blood.” This same racist belief was also prevalent in Nazi Germany. As Marion Kraft points out in “Coming in from the Cold: The Black German Experience, Past and Present,” “Racial politics during World War II and the postwar years, in particular, have reinforced the notion of a racially homogenous society” (2). There was a strong belief that German was a race, as well resistance against mixing of races. This belief was clearly also seen, and perhaps even began, in the colonial era. Because of the occupancy by Germans and the harsh treatment of the Namibian people, colonialism in Namibia was soon met with resistance. German soldiers responded this resistance by taking Namibian land and sending Namibians out to the desert. The ones that did not die from starvation or dehydration were brought back and put into a concentration camp. Although not meant to be death camps like the infamous Auschwitz during the Third Reich, these Namibians faced hard labor and a low food supply. As many as 60% of the population died from these harsh conditions. What was even more difficult for me to hear was the fact that after the death of some of the prisoners, the women would be forced to take sharp glass and cut the skin of the corpses away from the bones. The bones would then be taken to different universities and used for experimentation and for studies that attempted to prove scientific racism. This ideology, similar to ethnology, “attempted to link physical characteristics with intellectual and cultural ones,” as May Ayim notes in “Racism, Sexism, and Precolonial Images of Africa in Germany” (7). For me, this was reminiscent of eugenics. This is especially true when taking into account the attempted prevention of the “mixing” between white Germans and Namibian natives. In “Afro-Germans after 1945: The So-Called Occupation Babies,” Ayim defined racism as “an ideology that empowers one group to dominate economically, politically, and socially and to impose its own standards on others” (82). This is clearly seen happening in Namibia and other parts occupied by Germany and other imperial countries. I was hesitant to compare the racism in the United States to the racism in Germany for fear of minimizing or even invalidating the distinct experiences of Black Germans and Black Americans. However, it could be valuable to compare the reactions and ways that the countries themselves deal with historical and contemporary racism. Mainly, it was interesting—and very disappointing—to see how both countries on a “state” level, although acknowledging slavery and colonialism (usually to what I would consider a “small” extent), have failed to fully engage how the past has influenced racism today. For example, there are parallels between the controversy surrounding both the display of the confederate flag in the U.S., and the controversy of the street names in Wedding in Berlin. There have been several initiatives to change the name of the streets—especially those like Petersallee and Lüderitz Straße—to names that commemorate Black individuals. However, because many residents are conservative and against the changes and because there are different opinions of what to change the street names to, this has not yet been accomplished. Josephine cited two reasons as to why it was hard to find alternative names for streets. For the changes to appease everyone, the jury discussing the potential changes has decided that white Germans would have to be able to easily pronounce the names of the people that the streets would be dedicated to and also that those people for whom the new streets would be named have to be internationally known. Considering the very western-centric view that many people in the world unquestioningly have, filling just these two criteria with Black activists has proven to be quite a challenge. Still, there have been some initiatives to change the street names that have been successful, at least to an extent. For example, Josephine told us the story of Petersallee, named after Carl Peters, well known for his violent racist attitudes and behaviors during colonialism. However, it was rededicated to Hans Peter, who was known for helping Jewish people during the Third Reich. It is interesting that the narrative of colonialism—a narrative that strongly needs to be told—is cloaked behind the narrative of the Holocaust. I have noticed that the city of Berlin itself is in a way almost a monument to the horror of the Holocaust and the strong conviction that something like this can never happen again. And yet, conversations about colonialism have only recently begun to take form in mainstream society. In fact, an example of the disparity between which events Germany (many of its residents and the government) is both willing and unwilling to acknowledge in the public view is our last stop on our tour. Josephine showed us a plaque with information about German colonialism. There was graffiti present on one side of the plaque, some of which were partly covering a few words. Josephine mentioned that the government cares for the plaques that commemorate the Jewish lives lost in the Holocaust, so there is clean-up of any graffiti that might be present. However, this plaque is funded privately, and so does not get the same treatment. I want to conclude by noting that today, the influence of German colonialism is present in Namibia. Out of two million Namibian citizens, the 20,000 that are of German descent own 80% of the land. Also, the German language is commonly spoken there. However, despite the violent past of Germans in Namibia, the German government has failed to offer reparations for the Namibian people. Some argue that they already pay Namibia in the form of aid. However, that is not the same as acknowledging a violent colonial past. It is important for Germany, both the government and the German people, to acknowledge their role in colonialism and to strive towards a united Germany in which violence and discrimination against people of color is no longer an issue. In that way, Germany and the United States are very much alike. 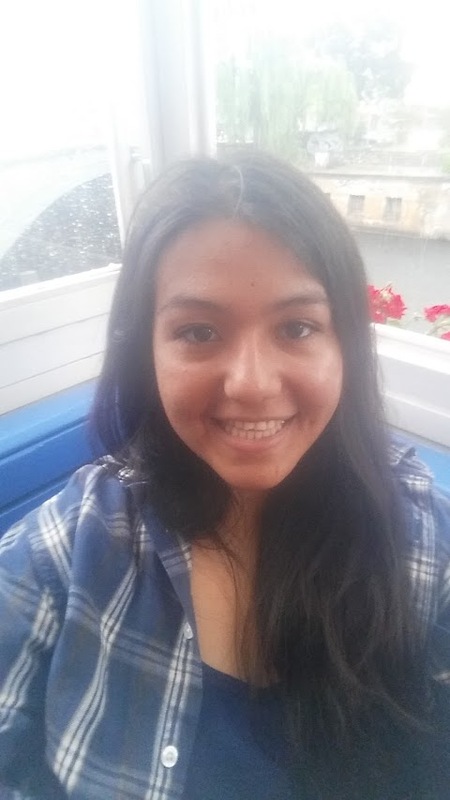 Jannet Gutierrez, class of 2019, is a Neuroscience major at Colorado College. She is also planning on minoring in German, having studied German all throughout high school. After going to Germany for the first time in 2014, she became interested in German culture, especially the diversity of large cities such as Berlin. At CC, she works for the Theater Department and plays the violin in the orchestra.